Great recipes for Great food. Here’s the thing >> I’m not at all ready to let go of summer. So I’m going to continue feeding you some summery recipes until the Big Chill (otherwise known as “fall”) arrives. It’s still quite warm around my part of the country, and I’m hoping it stays that way for a few more weeks, at least! 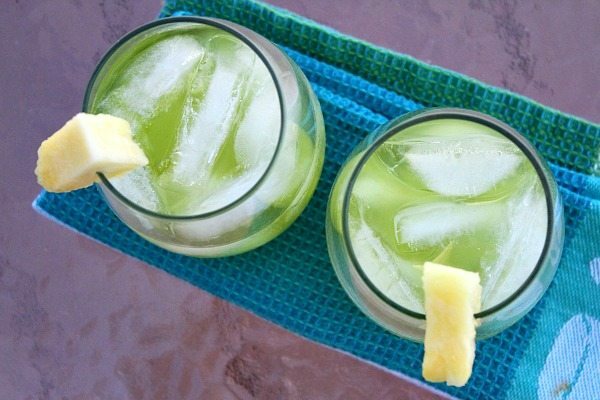 These summery cocktails will keep you in the mood for summer. They’re so simple to assemble with just 3 ingredients. I served them at a summer party and they were a big hit. In fact, I ended up running out of supplies because they were being guzzled down like crazy. There is something about pineapple juice in a drink that makes you want to drink one after the other (the sweetness of it, I guess?) But be careful… these have vodka in them too! 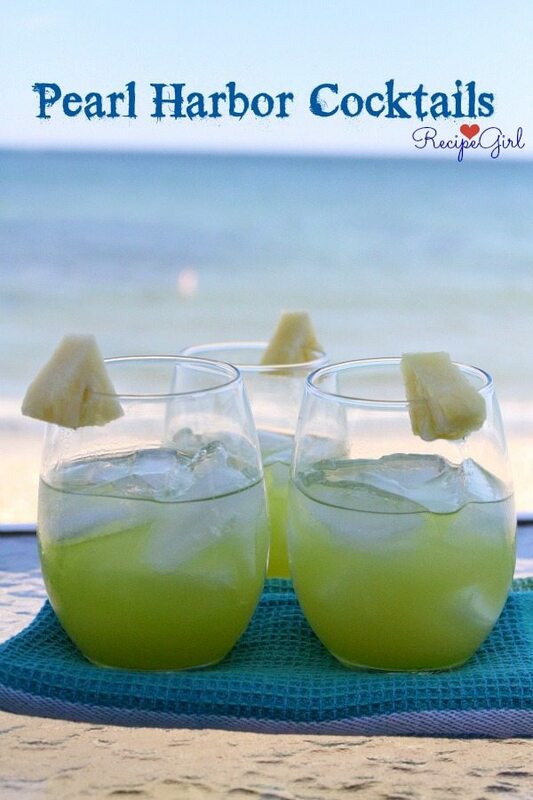 Melon liqueur (Midori) is what makes these green. Side note: Waaaaayyyy back in college, I ate at a lot of Mexican food restaurants in San Diego. My friends would always try to get me to drink margaritas, and I totally did not like them. HOWEVER, some old boyfriend or something ordered me a Midori margarita one day, and I’ve been hooked ever since. Midori is the only flavor of margarita that I enjoy. Imagine that? 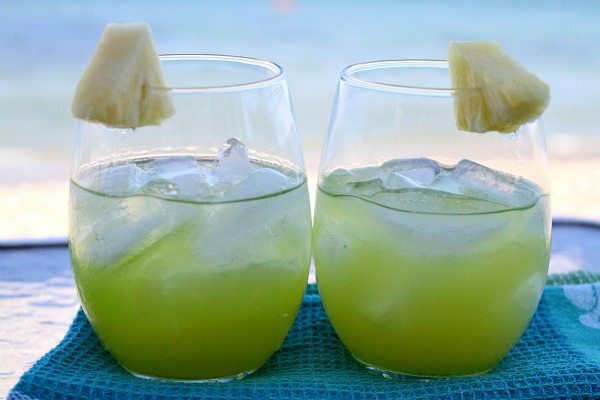 Anyway, so I’ll be making lots of Midori margaritas with my leftover Midori from making these delicious cocktails! It’s easy: sign up in under 10 seconds, tell us what kind of eBooks you love & we’ll email you a list of deals every day – FREE! Join now! Here’s another one of my posts >> Stuff I’ve Gotta Share and You’ve Gotta See! 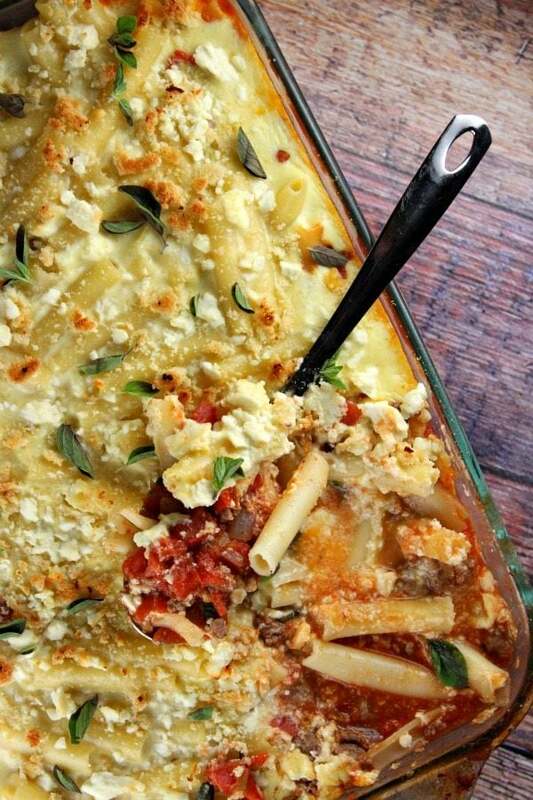 On Parade Magazine‘s blog this week, I shared this fabulous recipe > > GREEK BAKED ZITI. The recipe comes from David Joachim’s book, Cooking Light Global Kitchen- The World’s Most Delicious Food Made Easy. There are SO many recipes that I want to make from this book. I have a several pages bookmarked. My family enjoyed this recipe, and they’re going to be in for a treat when I make them some really different international dishes! 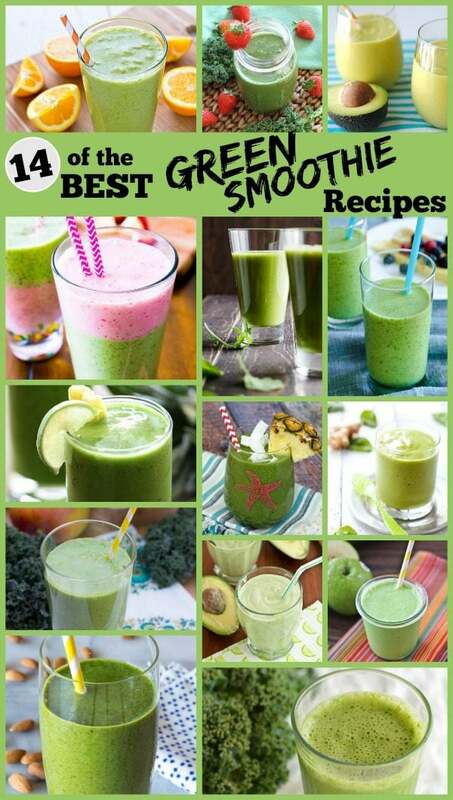 Here’s another fun post I shared on Parade‘s blog: 14 BEST GREEN SMOOTHIE RECIPES. 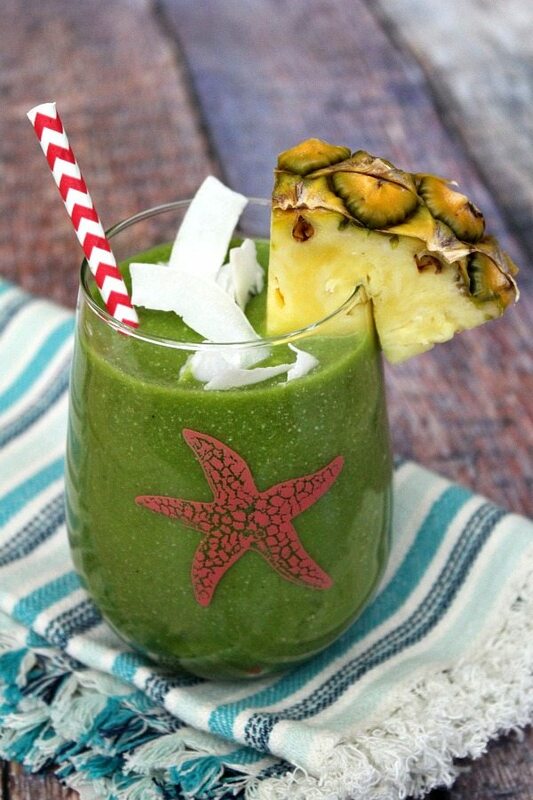 I might have mentioned before that I’m totally into drinking green smoothies for breakfast these days. Now I can drink a different kind of green smoothie every single day for two weeks! Seriously, these are the best recipes I’ve found- try them! Hey, Coffee Lovers! I know that’s most of you out there. 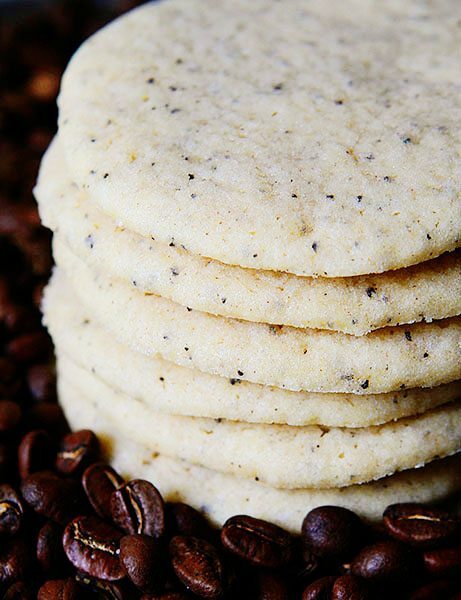 I’m actually NOT a coffee lover myself (can’t handle the caffeine), but I found a cookie that looks amazing for coffee people >> COFFEE SUGAR COOKIES from the i am Baker blog. Aren’t they such a great idea?? 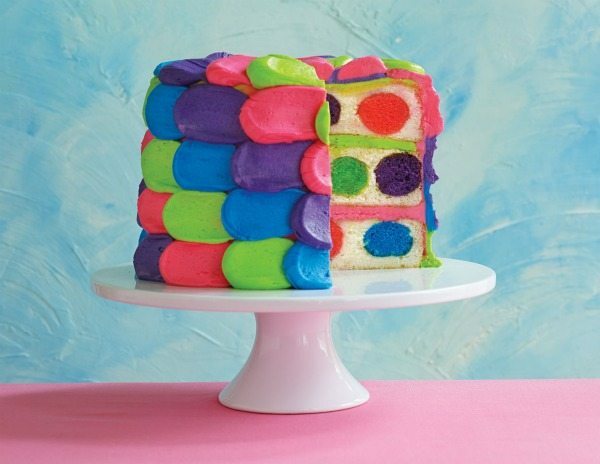 This super cutie cake caught my eye last week: POLKA DOT CAKE. I am tooooottttaalllly going to try it sometime this fall. This tutorial shows you step-by-step how to make it, and it doesn’t look that hard at all. 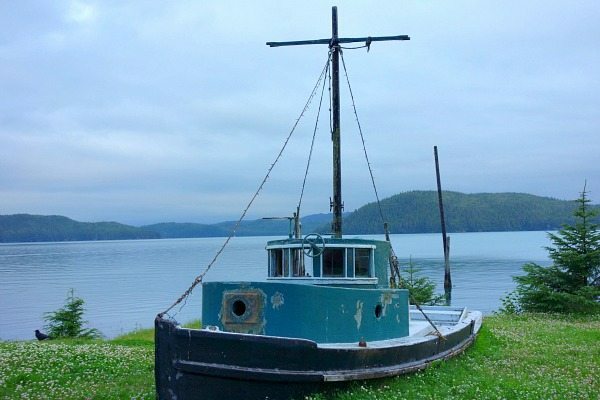 I had the opportunity to travel to Cordova, Alaska back in July. The folks at CopperRiverSalmon.org invited me and my 13-year old son Brooks to come to Cordova to learn all about Copper River Salmon. It was simply not a trip that we could pass up. Alaska?? Yes! We were definitely excited to visit and learn. Today, I’m sharing about that trip. 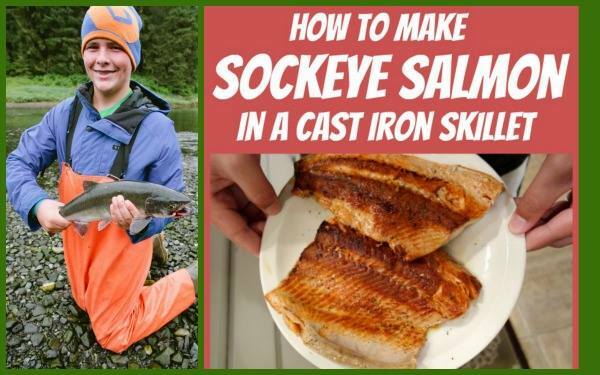 Have you been lucky enough to try Copper River Salmon? It’s the most delicious type of salmon I’ve ever had. Why is this salmon so special? 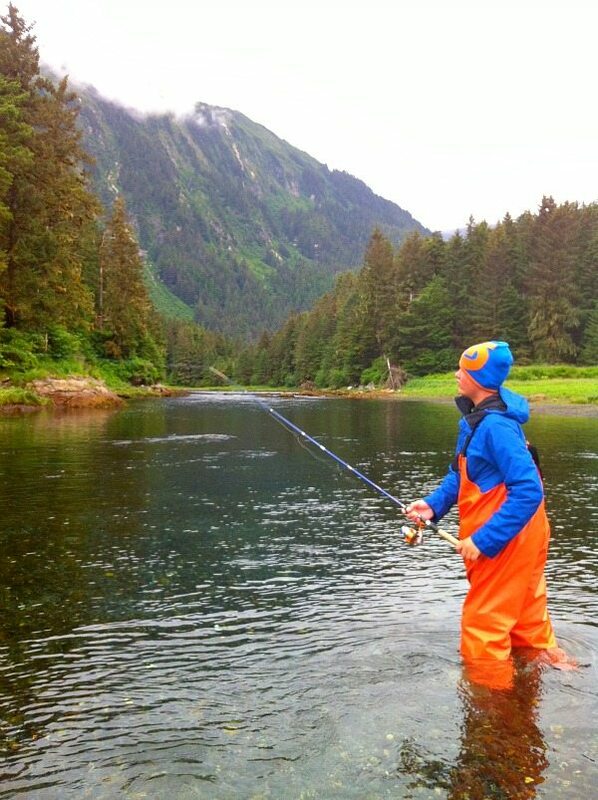 Copper River Salmon thrive in their natural wild environment, traveling up to 300 miles from open ocean to spawn in the Copper River. 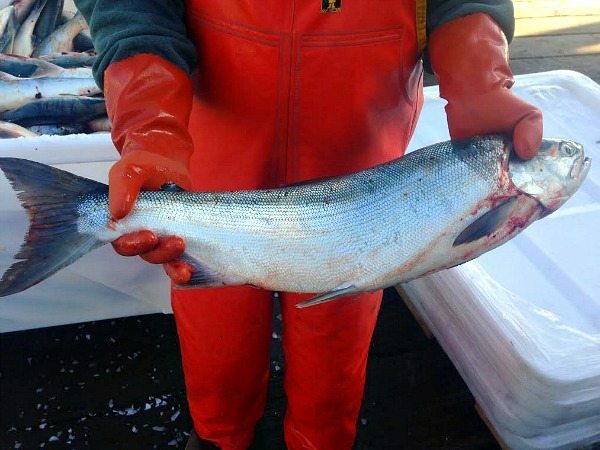 That long journey requires an abundance of energy storage in the form of fat- this is the fat that creates the unique flavor and texture of the Copper River Salmon and high levels of omega-3 fatty acids that make it so healthy to eat. 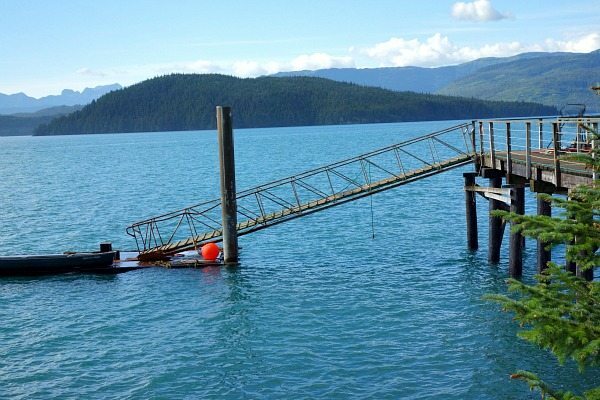 Every aspect of the salmon fisheries is strictly regulated, monitored and enforced. Everything is carefully managed for long-term sustainability. We flew in to Cordova’s totally charming little airport. This is Heidi Larsen from FoodieCrush.com. 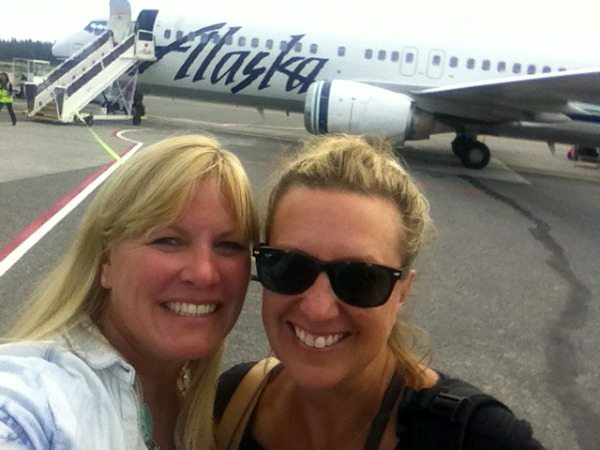 You can see how excited we were to have arrived in Alaska! … and this one. It was very peaceful. It was forced relaxation. 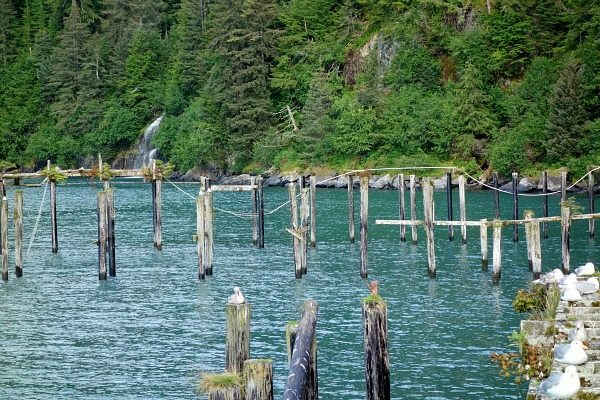 I often poured myself a glass of wine and walked out to the water’s edge to look for sea otters (which are totally abundant in the Prince William Sound). It’s a beautiful spot. The lodge had a restaurant on site. We had dinner there a couple of nights, and took advantage of the (delicious) breakfast there each morning. 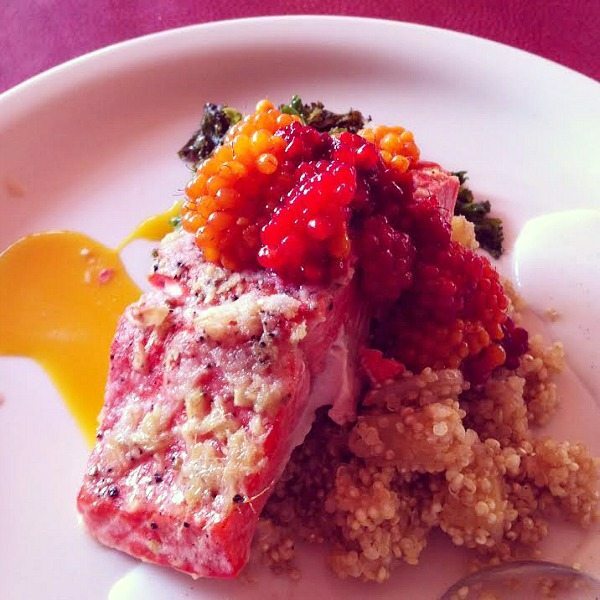 This was dinner on the night we arrived- a tender piece of Copper River Salmon topped with salmon berries. It was the first I’d heard of this type of berry. They’re a wild berry found growing pretty much everywhere in Alaska. Something to note: there is no alcohol on the premises at the lodge, but you can buy some in town and bring it to dinner with you. Our first day out, we drove out to see Child’s Glacier. 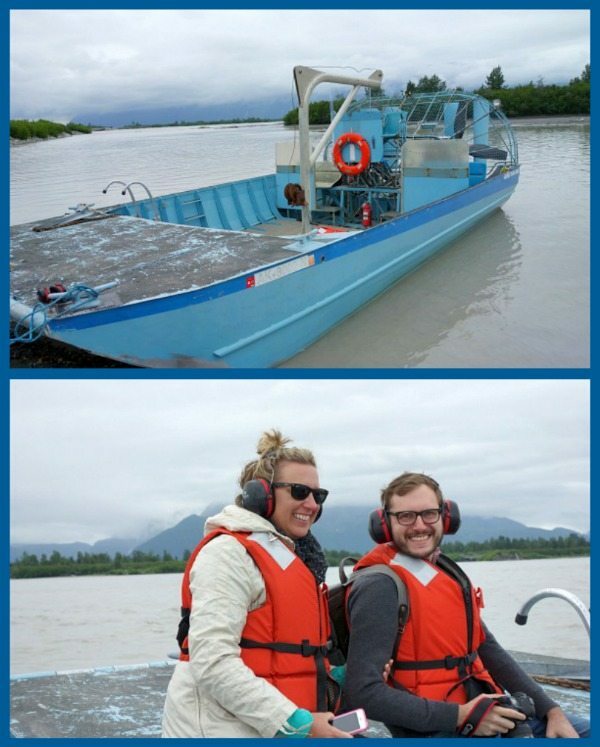 A section of the road that leads to the glacier was washed away a couple years back, so we had to board an airboat to get us to the other side. Here’s Heidi with Brian Samuels (athoughtforfood.net). The airboat is LOUD (which is why you see their ears protected). Unlimited Domains, Unlimited Disk Space and Unlimited Transfer For One Low Price. 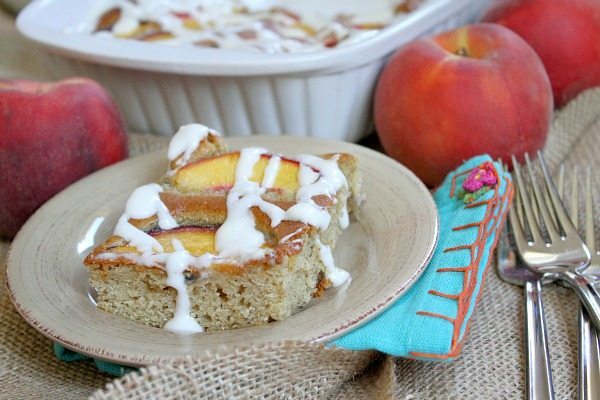 This turns out to be a tender, cinnamony cake topped with fresh peach wedges and drizzled with a simple cream cheese glaze. It’s the perfect dessert recipe for the end of summer! I’ve been up to my eyeballs in peaches lately. Washington State Fruit Commission sent me a case of peaches to play with. A case!! We ate loads of them, made some peach jam, left a few in the refrigerator and made this peach cake. I’ve never really noted where the peaches I’ve bought at the store have originated from, but now I pay attention. 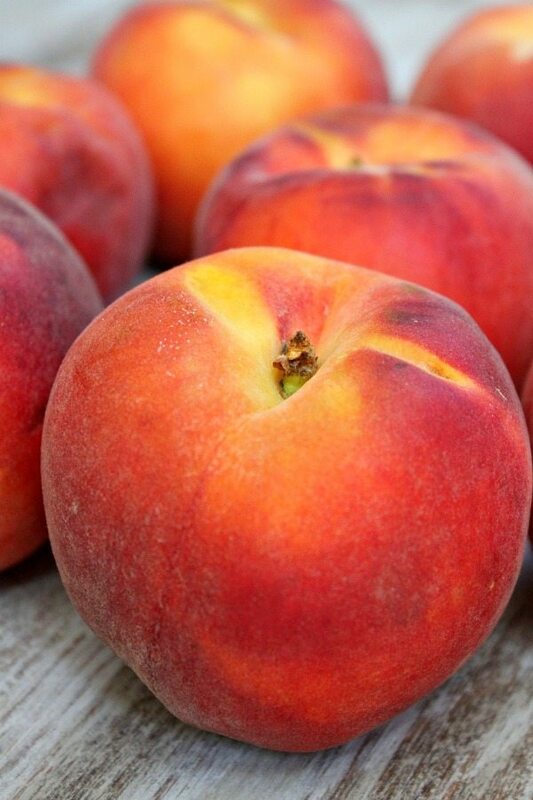 Washington Stone Fruit (peaches, nectarines, apricots, plums and prunes) are sold all over the USA while the season lasts- through about mid-September. Washington orchards are prized for producing stone fruits with unbelievable sweetness and flavor due to the regions unique microclimates and ancient volcanic soils that make for ideal growing conditions. The early summer weather in Washington has meant that there is a slightly larger crop with some of the sweetest, juiciest fruits yet! It’s true… the peaches that they sent me are very sweet and juicy! Turns out… peaches pack a nutritional punch! Look for these gorgeous peaches from Washington State in your market, and make this cake! It’ such an easy recipe >> The batter is spread into the bottom of your pan, peach wedges are arranged on top, then it’s baked. A cream cheesy glaze is drizzled on top. That’s it! Looking for something light while keeping you safe and comfortable during extended waterside activities? Shop New Drainmaker Shoe for Men, Women and Kids at Columbia! 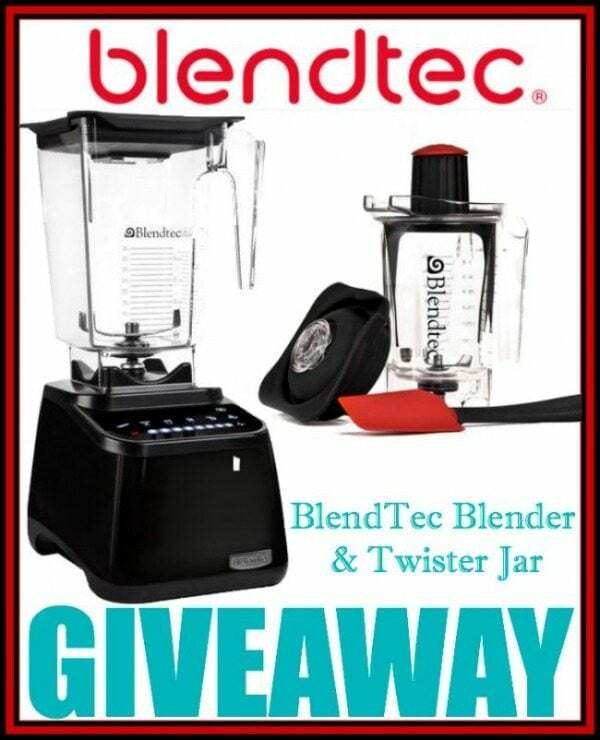 I have had one of these blenders for quite some time now. I’ve made things like homemade peanut butter, homemeade nutella, milkshakes, salad dressings, and my daily AM green smoothies. It’s super powerful and easy to clean. I love it more than any other blender I’ve owned. Plunger free and easy clean jar: Patented jar design flows ingredients towards the blade eliminating the need for tamper. Uniquely Blunt Safety Blade: Completely safe to use and clean, plus 80% thicker and 10 times stronger than the competitor. Smart Touchscreen Interface: Enables walk away blending and doesn’t harbor mold and bacteria like old fashioned knobs and dial blenders. Hardened Metal Drive Sockets: Never needs to be replaced, unlike other blenders that with plastic drive sockets that break under pressure. Quiet Ultra High Speed Motor: The industries highest motors blend even the toughest ingredients, like ice and frozen fruits, silky smooth. And now, you have the chance to win of these for your own kitchen! All you need to do is enter through Rafflecopter that will appear below (give it a few seconds to load! ), and follow some awesome new blogs while you are at it! This giveaway is open to those with USA mailing address only. GOOD LUCK! 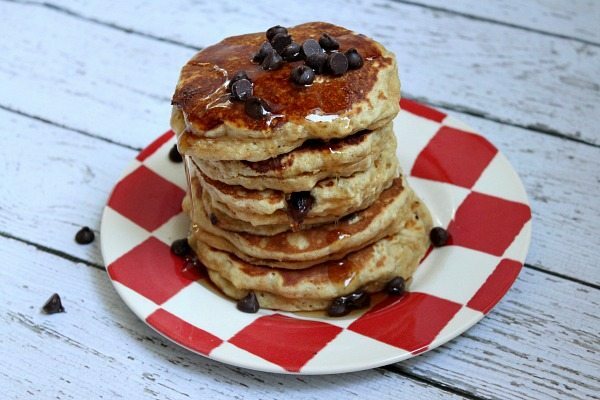 This is one of those, “Hey Mom, it’s Sunday AM and it would be really, really nice of you to make us pancakes for breakfast!” kind of recipes. 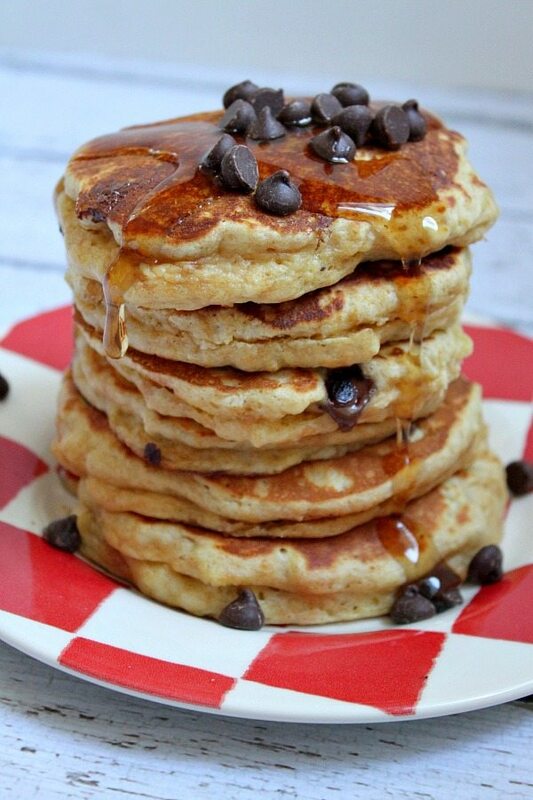 The best thing about pancakes is that they’re pretty versatile. I mess around with my best base recipes all the time to create new twists. This one is for peanut butter lovers. If you’re into the whole peanut butter + chocolate thing (like my boys), then you can certainly sprinkle in some chocolate chips too. 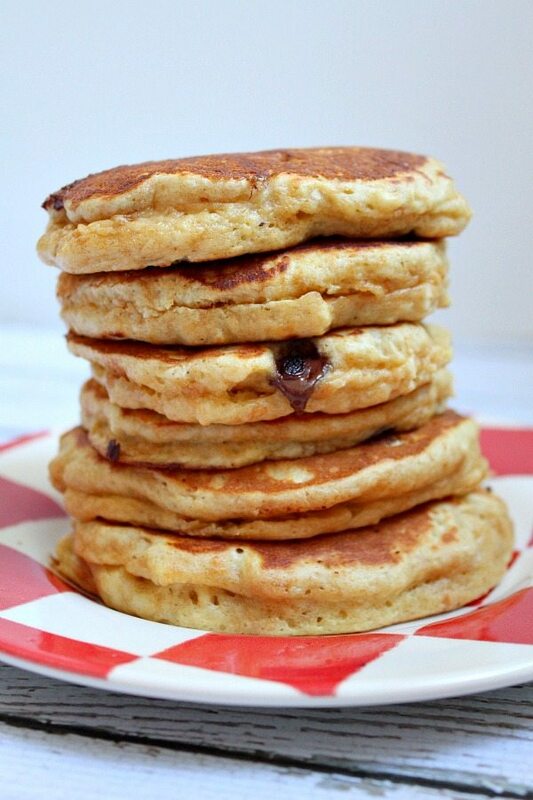 These were last Sunday’s pancake breakfast treat! See that major fluffy factor? These guys seriously puff up and remain puffy even after cooling a bit. That makes them quite filling. You don’t need a stack this big, for sure! 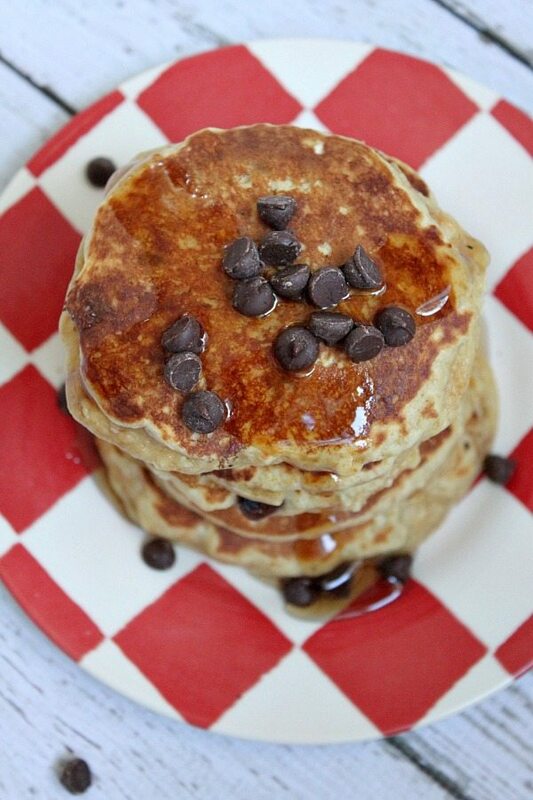 Extra chocolate chips anyone? Always a good thing. Unless you don’t like chocolate, of course. Then it’s not such a good thing. I’d say they were a hit! Will you be trying them this Sunday for your family? Create an event and sell tickets online through Eventbrite. It’s simple! Sign up and get started today. 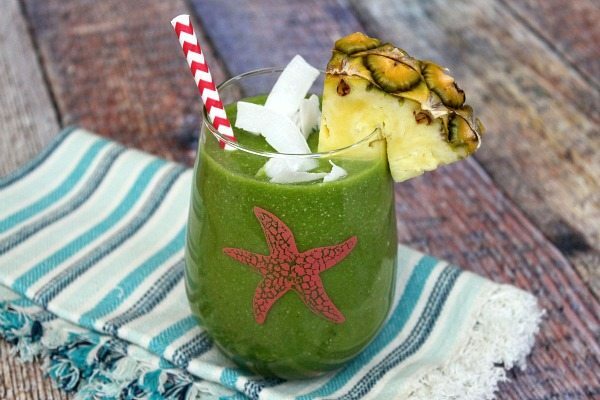 Why on earth would you want to eat a green smoothie every day? Because you’re able to pack a good punch of nutrients into one breakfast drink, that’s why! My body is happy to be eating things like spinach, kale, cucumber, avocado, mint, chia seeds, hemp hearts, and plenty of fruit for breakfast by drinking a drink that is totally delicious and filling! Yes, it’s filling. I usually drink my smoothie early in the morning, then do my workout, then eat a Greek yogurt with almonds later in the morning. It has become a habit now. It’s something that works for me, and I love it. And guess what??? I don’t miss eating cereal for breakfast, and I feel so much better throughout the rest of the day! Learn and Memorize the Vocabulary of Any Language Using the Magnetic Memory Method. Here’s the latest from my posts on Parade Magazine‘s blog > 10 RECIPES USING FRESH SUMMER TOMATOES. Are tomatoes bursting off your vines yet this summer? 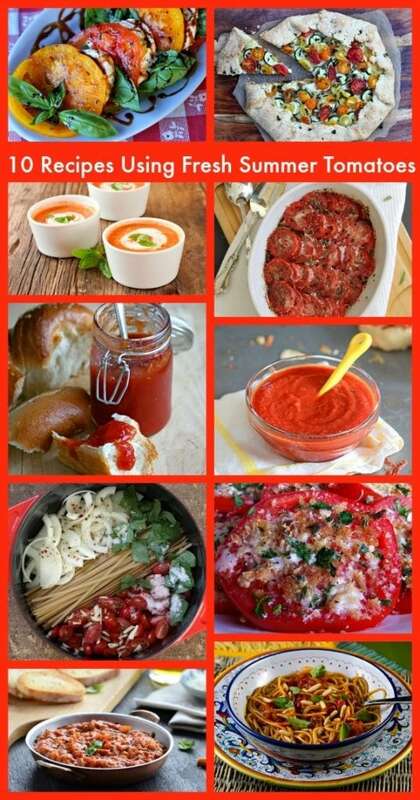 I’ve collected 10 delicious recipes for you to try… using your fresh summer tomatoes – salad, soup, tart, pasta, sauces, and even JAM! Check ‘em all out and try what interests you most. 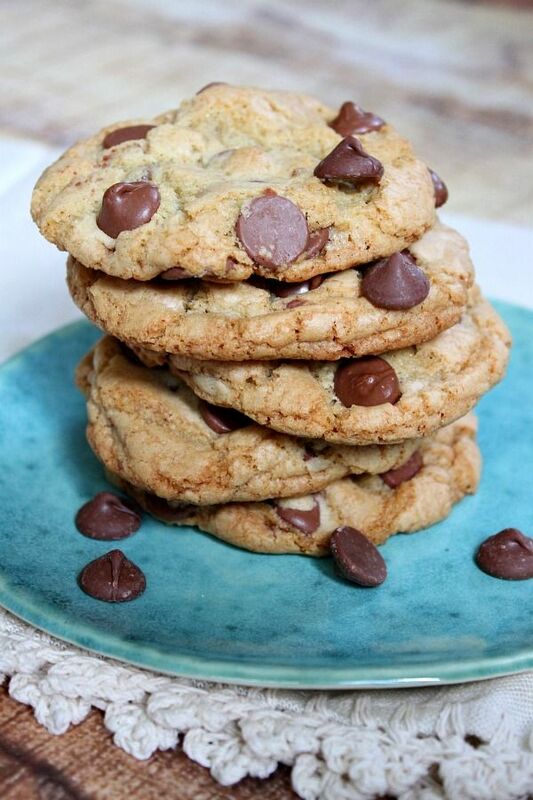 Another recipe I shared on Parade recently was this one > BIG CHEWY CHOCOLATE CHIP COOKIES. It’s my new favorite chocolate chip cookie recipe! 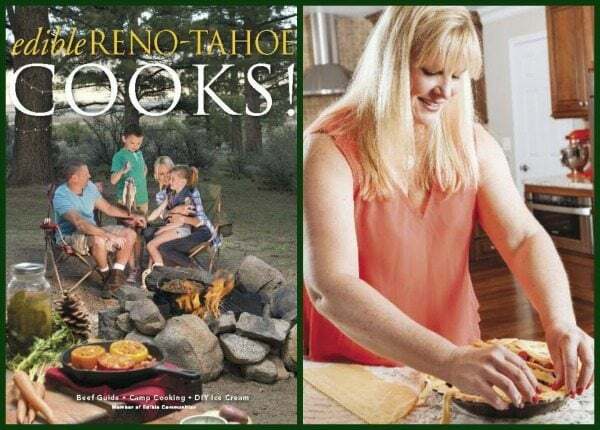 There’s a little article featuring (RecipeGirl) in the current issue of Edible Reno-Tahoe Magazine. I had so much fun doing this interview with them, and the photographer was awesome too. If you’d like to take a peek at the interview online, you can do so here > RecipeGirl to the Rescue. Here’s a food blog you should be following if you love Italian food!!! > ITALIAN FOOD FOREVER – written by Deborah (who spends 6 months of the year in Umbria). Deborah married into an Italian family 40 years ago and has been learning from her family members and visiting Italy on a regular basis ever since. Anything recipe you’re looking for that is truly Italian food can be found on her site. Her latest post: Spinach and Goat Cheese Lasagna! Deborah is wonderfully talented, so check out this blog! Name anything in the world, and we’ll show you hundreds of products that celebrate it. Or, you can design your own. 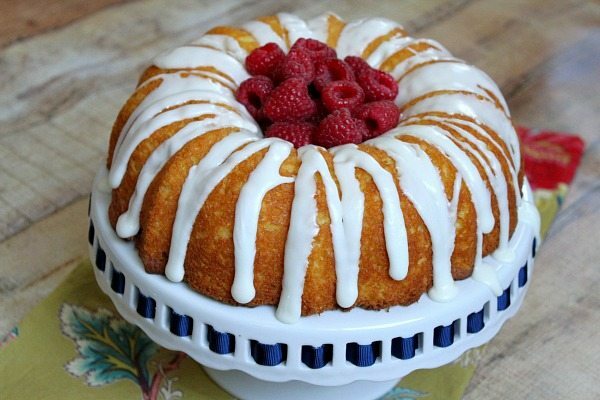 I’ve always been a fan of the bundt cake… something about its perfect round shape with a drizzle of frosting down the sides just makes it seem so simplistic and approachable. It’s a great cake concept in general- all of the batter is poured into a well-greased, rounded pan, then baked, popped out of the pan, and that’s about it. 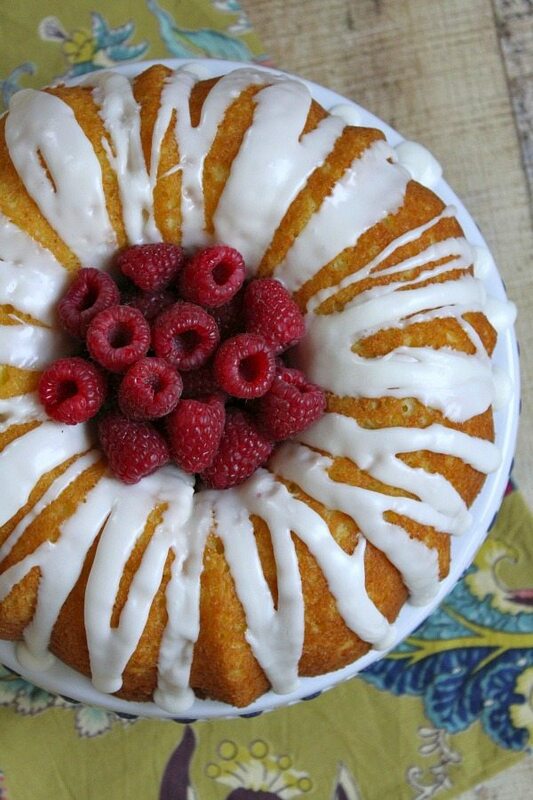 The shape and imprint of the bundt pan provides decoration all on its own. Bundts are the bomb. Or… as my 13 year old often says: thebombDOTcom. This cake turns out tender and delicious- so summery with the “lemonade” theme and a touch of raspberry. 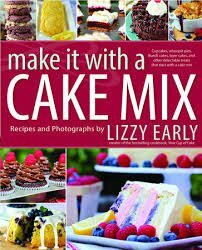 No one in my family thought it tasted anything like a boxed cake mix, yet the mix was an easy base for the rest of the recipe. I think the addition of pudding mix helped make this cake extra soft and melt-in-your-mouth yummy.